San Salvador volcano is one of many volcanoes along the volcanic arc in El Salvador. This volcano, having a volume of about 110 cubic kilometers, towers above San Salvador, the country’s capital and largest city. The city has a population of approximately 2 million, and a population density of about 2100 people per square kilometer. The city of San Salvador and other communities have gradually encroached onto the lower flanks of the volcano, increasing the risk that even small events may have serious societal consequences. San Salvador volcano has not erupted for more than 80 years, but it has a long history of repeated, and sometimes violent, eruptions. The volcano is composed of remnants of multiple eruptive centers, and these remnants are commonly referred to by several names. The central part of the volcano, which contains a large circular crater, is known as El Boquerón, and it rises to an altitude of about 1890 meters. El Picacho, the prominent peak of highest elevation (1960 meters altitude) to the northeast of the crater, and El Jabali, the peak to the northwest of the crater, represent remnants of an older, larger edifice. The volcano has erupted several times during the past 70,000 years from vents central to the volcano as well as from smaller vents and fissures on its flanks  (numerals in brackets refer to end notes in the report). In addition, several small cinder cones and explosion craters are located within 10 kilometers of the volcano. Since about 1200 A.D., eruptions have occurred almost exclusively along, or a few kilometers beyond, the northwest flank of the volcano, and have consisted primarily of small explosions and emplacement of lava flows. However, San Salvador volcano has erupted violently and explosively in the past, even as recently as 800 years ago. When such eruptions occur again, substantial population and infrastructure will be at risk. Volcanic eruptions are not the only events that present a risk to local communities. Another concern is a landslide and an associated debris flow (a watery flow of mud, rock, and debris--also known as a lahar) that could occur during periods of no volcanic activity. An event of this type occurred in 1998 at Casita volcano in Nicaragua when extremely heavy rainfall from Hurricane Mitch triggered a landslide that moved down slope and transformed into a rapidly moving debris flow that destroyed two villages and killed more than 2000 people. Historical landslides up to a few hundred thousand cubic meters in volume have been triggered on San Salvador volcano by torrential rainstorms and earthquakes, and some have transformed into debris flows that have inundated populated areas down stream. Destructive rainfalland earthquake-triggered landslides and debris flows on or near San Salvador volcano in September 1982 and January 2001 demonstrate that such mass movements in El Salvador have also been lethal. This report describes the kinds of hazardous events that occur at volcanoes in general and the kinds of hazardous geologic events that have occurred at San Salvador volcano in the past. The accompanying volcano-hazards-zonation maps show areas that are likely to be at risk when hazardous events occur again. 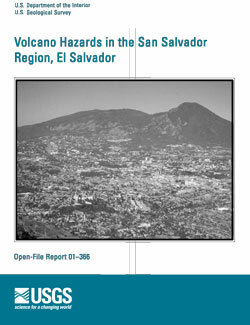 Major, J.J., Schilling, S.P., Sofield, D.J., Escobar, C.D., and Pullinger, C.R., 2001, Volcano Hazards in the San Salvador Region, El Salvador U.S. Geological Survey Open-File Report 01-366, 24 pp, 2 plates, https://pubs.usgs.gov/of/2001/0366/.